Today, the impressive Aztec are among the most famous and well-documented of Mexico’s many pre-Columbian civilizations, and rightfully so – in the space of just a few generations, the Aztec – also known as the Mexica – conquered their neighbors and founded a formidable and wealthy empire. The Aztec developed a rich cosmology and controlled vast networks of trade and tribute reaching north, south, east, and west for many thousands of miles. Their monumental architecture is still impressive today – even in ruins excavated from beneath Mexico City, the imperial capital of the Spanish conquistadors who deliberately attempted to erase the Aztec from the face of the Earth. This is as fitting a name as any – the Aztec went on to model much of their religion, their grand architecture, their very view of the world on the massive pyramids, finely-hewn artifacts, and colorfully rendered imagery they found here. Even today, visitors to Teotihuacan find themselves gasping in awe, few realizing that anything so monumental and impressive exists anywhere outside of a better-publicized place like Egypt – that prehistoric American peoples could create something so staggeringly massive. View of the Avenue of the Dead and the Pyramid of the Sun, from the Pyramid of the Moon in 2016. The smaller flat-topped structure central to this photo is a talud-tablero, which are numerous at Teotihuacan. (Teotihuacan, Mexico, 2016.) Click to enlarge. Let’s take a walk down the Avenue of the Dead and figure out what we know about the great city of Teotihuacan. Name and briefly describe the main features of the ritual center of Teotihuacan. Which elements of architecture and decoration appear in later Mesoamerican cultures? Teotihuacan’s broad central avenue, called “Avenue of the Dead” (a translation from its Nahuatl name Miccoatli), runs east and west and is flanked by impressive ceremonial architecture, including the immense Pyramid of the Sun (third largest in the world after the Great Pyramid of Cholula and the Great Pyramid of Giza). Along the Avenue of the Dead are many smaller talud-tablero platforms. The Aztecs believed these were tombs, inspiring the name of the avenue. Scholars have now established that these ceremonial platforms were topped with temples. Schematic representation of the talud-tablero style used in many Mesoamerican pyramids and a prominent stylistic feature of Teotihuacano architecture. It is found in many cities and cultures but is strongly associated with the Teotihuacan culture of central Mexico, where it is a dominant architectural style. Talud-tablero’s appearance in many cities during and after Teotihuacan’s apogee is thought to be indicative of the city’s powerful influence in Mesoamerica as a trade, art, and cultural center, with the architectural style serving to either emulate Teotihuacan or affiliate the cities together. The geographical layout of Teotihuacan is a good example of the Mesoamerican tradition of planning cities, settlements, and buildings as a representation of their view of the Universe. Its urban grid is aligned to precisely 15.5º east of North. One theory says this is due to the fact that the sun rose at that same angle during the same summer day each year. Settlers used the alignment to calibrate their sense of time or as a marker for planting crops or performing certain rituals. The Temple of the Feathered Serpent is the modern-day name for the third largest pyramid at Teotihuacan. It is located at the southern end of the Avenue of the Dead. The Feathered Serpent Pyramid is a six-level step pyramid built in the talud-tablero style. 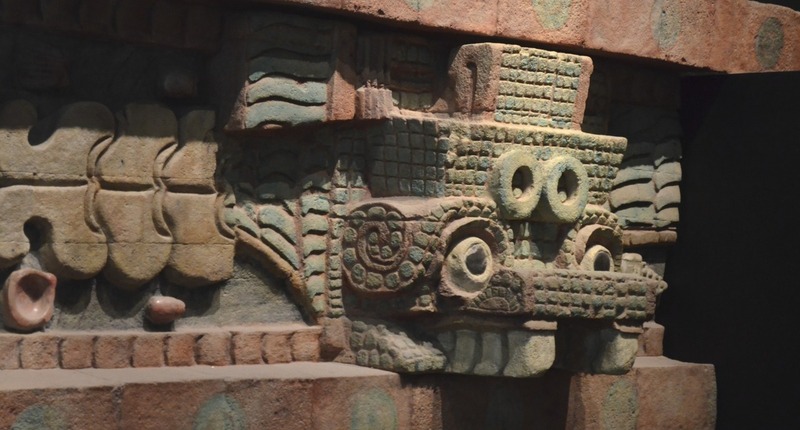 The outside edges of each level are decorated with feathered serpent heads alternating with those of another snake-like creature, often identified as Tlaloc. This structure is notable partly due to the discovery in the 1980s of more than a hundred probably sacrificial victims found buried beneath the structure. The burials, like the structure, are dated to between 150 and 200 CE. The pyramid takes its name from representations of the Mesoamerican “feathered serpent” deity which covered its sides. These are some of the earliest-known representations of the feathered serpent, often identified with the later Aztec god Quetzalcoatl and the Maya god Kukulkan. The Pyramid of the Sun is the largest building in Teotihuacan, believed to have been constructed about 200 CE. The name Pyramid of the Sun comes from the Aztecs, who visited the city of Teotihuacan centuries after it was abandoned; the name given to the pyramid by the Teotihuacanos is unknown. The Pyramid of the Sun shares the same general shape and contours as the large mountain behind it. Archaeologists believe that this is intentional – Teotihuacanos believed that at the beginning of the current era, when the whole world was in darkness, the gods gathered before that mountain. There they lit a huge fire and sacrificed themselves around it, bringing light to the world, giving birth to the new era. Every fifty-two years, Teotihuacanos reenacted this sacrifice in front of the Sun Pyramid with the New Fire Ceremony. All of the sacred fires in all of the temples throughout the region were extinguished before this ceremony; a priest would start a new fire at the base of the Sun Pyramid. Runners would light torches from this sacred fire, carrying them forth to relight all of the temple fires in the realm. The ancient Teotihuacanos finished their pyramid with lime plaster imported from surrounding areas, on which they painted brilliantly colored murals. While the pyramid has endured for centuries, most of the paint and plaster have crumbled away over the centuries. A few fragments of murals survive: jaguar heads and paws, stars, and snake rattles are among the remaining images associated with the pyramids. Imagine the pyramids below in vivid reds, yellows, and blues – the city must surely have been one of the most colorful in the ancient world. It is thought that the Pyramid of the Sun was built in veneration of a deity within Teotihuacan society, however, little evidence exists to elaborate on this hypothesis. The destruction of the temple on top of the pyramid, by both deliberate and natural forces prior to the archaeological study of the site, has so far prevented identification of the pyramid with any particular deity. The Pyramid of the Moon is the second largest pyramid at Teotihuacan, after the Pyramid of the Sun and mimics the contours of the mountain Cerro Gordo, just north of the site. The Pyramid’s construction between 200 and 250 CE completed the bilateral symmetry of the temple complex. A slope in front of the staircase gives access to the Avenue of the Dead, a platform atop the pyramid was used to conduct ceremonies in honor of the Great Goddess of Teotihuacan, the goddess of water, fertility, the earth, and even creation itself. Why don’t modern historians have a better idea of who built Teotihuacan? What can we say with relative certainty about Teotihuacan? What kind of evidence supports these conclusions? The early history of Teotihuacan is quite mysterious, and the origin of its founders is uncertain. Around 300 BC, people of the central and southeastern area of Mesoamerica began to gather into larger settlements. Teotihuacan was the largest urban center of Mesoamerica before the Aztecs, almost 1000 years prior to their epoch. The city was already in ruins by the time of the Aztecs. At artist’s rendition depicts the rulers of Teotihuacan making a sacrificial offering at the Temple of the Feathered Serpent. Seen in the background is the Temple of the Sun. Both structures would likely have been covered in red plaster during the city’s heyday. The city reached its peak in AD 450, when it was the center of a powerful culture whose influence extended through much of the Mesoamerican region. Teotihuacan’s wealth was based at least in part on its control of an exceptionally pure form of green obsidian, which was prized for use in cutting tools, weapons, jewelry, and art. Obsidian originating in Pachuca, the mine controlled by Teotihuacan, has been found as far north as Arizona and as far south as Guatemala. At its peak, Teotihuacan covered over 30 km² (over 11 1⁄2 square miles), and perhaps housed a population of 150,000 people, with one estimate reaching as high as 250,000. Various districts in the city housed people from across the Teotihuacano region of influence – in fact, foreigners likely outnumbered natives at the city’s height. Notably absent from the city are fortifications and military structures. Teotihuacan was a mix of residential and work areas. Upper-class homes were usually compounds that housed many such families, and one compound was found that was capable of housing between sixty and eighty families. Such elite residences were typically made of plaster, each wall in every section elaborately decorated with murals. More than anything, these compounds bear a striking resemblance in function to modern apartment complexes. An apartment complex at Teotihuacan, featuring a series of rooms with porches, opening into central courtyards. Apartment complexes featured at least one altar to a patron god, with smaller shrines in individual apartments, demonstrating as in most ancient societies how central spirituality was to life at Teotihuacan. One sign of social class were the patron gods found on the altar in the home. For example, the highest classes seemed to pray to Tlaloc, the Storm God, the god of rain and fertility, who was later adopted as a key god in the Aztec religion. Host figures such as this one are found in burial sites throughout Teotihuacan, especially in those belonging to the upper class. Beyond this upper class enclave were neighborhoods of people from varied regions throughout Mexico, living side by side and in peace at Teotihuacan, with distinct quarters occupied by Otomi, Zapotec, Mixtec, Maya, and Nahua peoples. Although they were living far from their homelands, they often retained many elements of the own culture. The city was a center of industry, home to many potters, jewelers, and craftsmen. It is thought that beyond this ethnic grouping, residents were divided into apartment complexes based on their profession – so stonemasons who worked the city’s signature export, green obsidian, lived in one area, while tailors lived in another, and mural painters in the another. This ceremonial mask is made from Teotihuacan’s signature product, green obsidian. Chinampas were created by staking out the shallow lake bed and then fencing in the rectangle with wattle. The fenced-off area was then layered with mud, lake sediment, and decaying vegetation, eventually bringing it above the level of the lake. Often trees such as cypress were planted at the corners to secure the chinampa. In some places, the long raised beds had ditches in between them, giving plants continuous access to water and making crops grown there independent of rainfall. Chinampas were separated by channels wide enough for a canoe to pass. These raised, well-watered beds had very high crop yields with up to 7 harvests a year. This mural from Teotihuacan depicts a player kicking a ball. Ball games were popular – and sometimes religious – activities in many Mesoamerican societies. Inscriptions from Maya cities show that Teotihuacan nobility traveled to, and perhaps conquered, local rulers as far away as Honduras. Maya inscriptions note an individual nicknamed by scholars as Spearthrower Owl, apparently ruler of Teotihuacan, who reigned for over 60 years and installed his relatives as rulers of Tikal and Uaxactun in Guatemala. An engraving from the Maya ruins at Tikal, believed to depict Spearthrower Owl, a presumed leader of Teotihuacan. The consensus among scholars is that the primary deity of Teotihuacan was the Great Goddess of Teotihuacan. Because the dominant civic architecture is the pyramid, it is believed that, as in many ancient societies from around the world, political power was based on religious authority – on a leader’s ability to parlay with and appease the gods, bringing favorable weather and harvests to the people. Teotihuacan refined the Mesoamerican pantheon of deities, whose origins dated from the time of the Olmec. Of special importance were the worship of Quetzalcoatl and Tláloc. Trade links – associated with Teotihuacan’s signature good, green obsidian, one of the most valuable products in all of the Mesoamerica -promoted the spread of these cults to other Mesoamerican societies, who took and transformed them. In fact, we don’t know exactly how the Teotihuacanos referred to these gods, as the names Quetzalcoatl and Tlaloc are passed down from the Aztec. These gods from the later Aztec pantheon were heavily influenced by the gods of Teotihuacan. Look carefully and you will see what seems to be a word balloon – like in a modern comic strip – coming from the mouth of the priest depicted in this mural from Teotihuacan. The glyphs, or symbols, inside represent a writing system that experts don’t fully understand – but that seems to refer to proper names of gods, people, and places. What evidence supports the best theories for the decline of Teotihuacan? Why did the Aztec refer to this city as Teotihuacan – the place where gods were born? The ruins of Teotihuacan as seen from the air. Scholars once thought that invaders attacked Teotihuacan in the 7th or 8th century, sacking and burning it. More recent evidence, however, seems to indicate that the burning was limited to the structures and dwellings associated primarily with the ruling class. Some think this suggests that the burning was from an internal uprising. They say the invasion theory is flawed because early archaeological work on the city was focused exclusively on the palaces and temples, places used by the upper classes. Because all of these sites showed burning, archaeologists concluded that the whole city was burned. Instead, it is now known that the destruction was centered on major civic structures along the Avenue of the Dead. Some statues seem to have been destroyed methodically, with their fragments dispersed. Evidence for population decline beginning around the 6th century lends some support to the internal unrest hypothesis. The decline of Teotihuacan has been correlated to lengthy droughts related to the climate changes of 535–536. This theory of ecological decline is supported by archaeological remains that show a rise in the percentage of juvenile skeletons with evidence of malnutrition during the 6th century. This finding does not conflict with either of the above theories, since both increased warfare and internal unrest can also be effects of a general period of drought and famine. Use blocks, textbooks, or other classroom items approved by your teacher to build a pyramid matching the proportions of the Pyramid of the Sun. Compete with other small groups, or combine your efforts to create something truly monumental in scale. Get a sense of just how big this place is. Either in real life (walking and using a cell phone or GPS device to mark the distance) or using Google Maps, overlay the Avenue of the Dead to scale over your city. Include the positions of the Pyramid of the Sun, the Pyramid of the Moon, and the Temple of the Feathered Serpent. Compare and contrast the organization of your own city with that of Teotihuacan. What do these layouts suggest about the values, organization, and priorities of their respective cultures? What is at the center? How do people move around? Where do the poor live? The rich? Where is business done? Where are the monuments? What are the most impressive buildings? Where does the food come from? 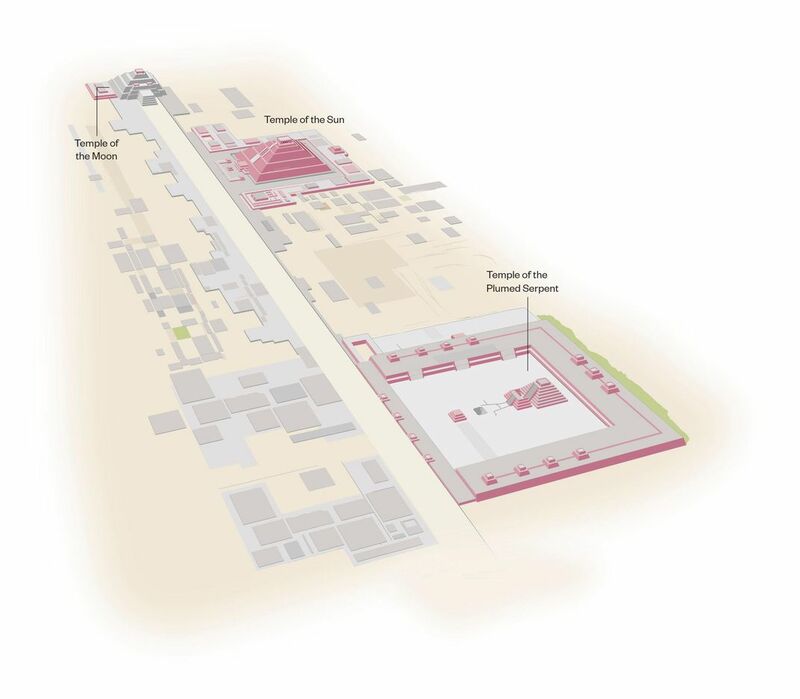 Create an infographic that puts Teotihuacan into context. Consider the facts, statistics, and details that make this arguably little-known civilization so incredible. Use this or any one of the many other free tools you can find online to create an informational graphic that teaches others about Teotihuacan. Comix Azteca Volume One by Thomas Kenning and Phil Skaggs.